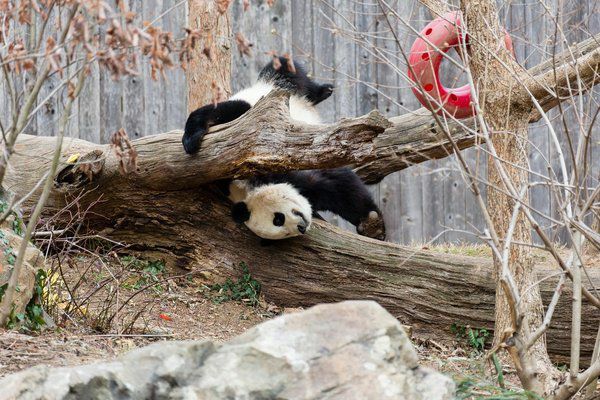 February 21 was Bao Bao's final day at the Smithsonian National Zoo. It is in Washington, D.C. For the young giant panda, it might as well have been like any other. "Bittersweet is the best word I can use to describe it," keeper Stacey Tabellario told me. She is one who has worked with Bao Bao throughout the animal's life. So Tabellario has always known that she would have to say goodbye. "You know it's going to happen," she said. "But that doesn't mean there weren't tears this morning. And that there won't be more tears later." You wouldn't have known it, though, to watch Tabellario and her fellow keepers. They were busy getting ready for Bao Bao's departure. They carried supplies for the flight to a van. The official manifest included "50 pounds of bamboo, 2 pounds apples, two bags of leafeater biscuits, cooked sweet potatoes and water." FedEx staff loaded it into an AMJ. It is a sizable aluminum shipping container. It's large enough to carry food for an entire zoo. Soon after, Bao Bao herself passed by. She was hidden by the holed white walls of her own enclosure. The crate weighed hundreds of pounds. It was carried by a bright yellow JCB forklift. It was decorated with an oversized pair of black panda ears and a bushy white tail. Turning a corner, the forklift operator loaded his precious cargo onto a second truck. It also was decorated. It had an enormous panda decal. Much of this phase of the operation unfolded out of sight. But what followed was seen by all. A group of panda keepers surrounded Marty Dearie. He would go with Bao Bao on her 16-hour flight to Chengdu. A veterinarian from the zoo also would make the trip. One after the next, each of them hugged Dearie. "We are a very strong team," Tabellario told me. I had asked her about this seemingly impromptu ritual. "As much as we love the animals, we all love each other too." Not long after, the two trucks pulled out. They headed to Washington's Dulles Airport. There, a similar ceremony played out. From a podium, Dennis Kelly, director of the zoo, addressed the importance of Bao Bao's trip. He stressed that it was critical to give her the opportunity to reproduce. Connecting these efforts to everything the zoo does, Kelly noted, "Saving species is a forever business." It was an apt phrase. Not least of all because life was presumably going on as usual back at the National Zoo. The grounds had been closed for the morning departure. But keepers were looking after other animals behind the scenes. It was the same as any other day at the zoo. Things will change for the pandas. But the three who remain at the zoo likely won't notice Bao Bao's departure any more than she did the hullabaloo that came before it. If anything, they may enjoy the change. The younger Bei Bei is already on the verge of weaning from his mother. He will soon move into Bao Bao's now vacant yard. And before long, Mei Xiang may be pregnant again. That is a hope that presents both new challenges and exciting opportunities for the zoo. I think that this is awesome because there trying to help pandas! and as thy said "there's no rest for the panda team". I hope people all over the world are doing this because heaven knows we need it! China has strict agreements because pandas represent them and who they are. 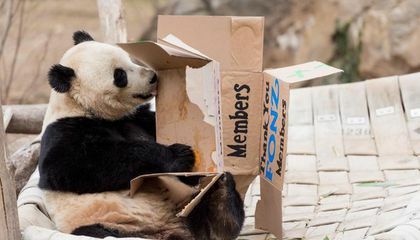 This article discusses how the panda Bao Bao's last day at the national zoo. Describing how him leaving cause a different emotions from the workers at the zoo. I hate that pandas are going extinct its so sad, at least some people are trying to help the endangered species.